Joshin Super Kids Character Land Hall, better known as Osaka Gundams is located in Nipponbashi’s Den-Den town. It’s a Gundam lovers dream shop, and the prices are the best I’ve in all the cities I’ve visited! 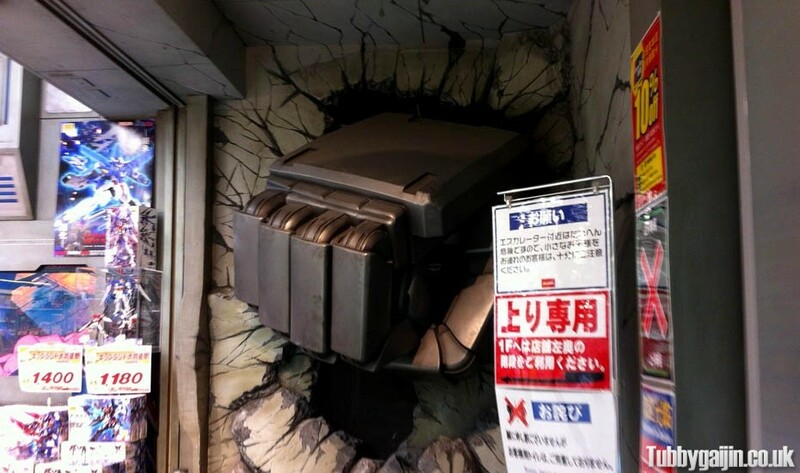 The second floor is all Gundam, as you head up the escalator you’re greeted by a full size Gundam hand punching through the wall! 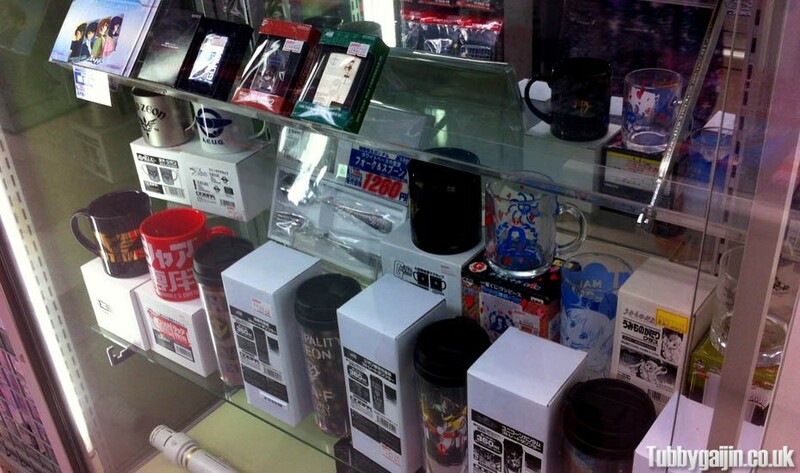 New items on display, with a big tv screen in the background playing Zeta Gundam. 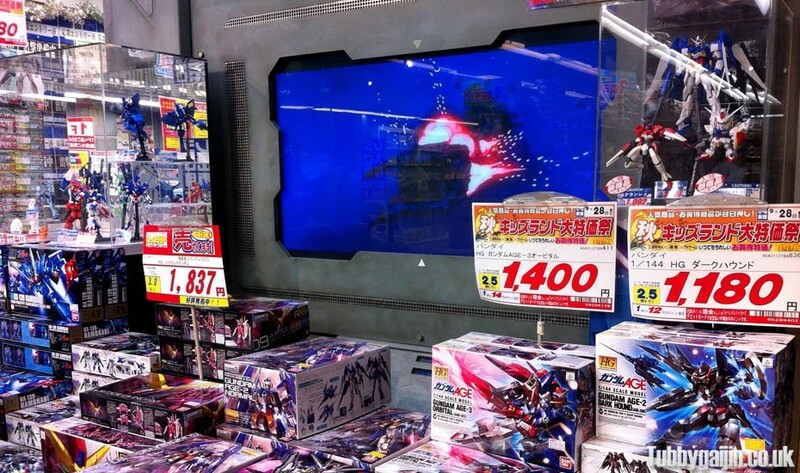 End display of popular Master Grade kits from Wing, Seed and UC. 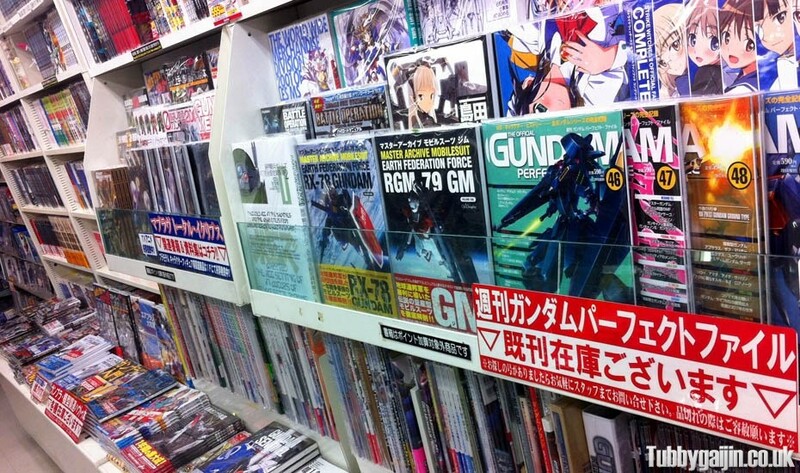 Gundam SEED section. SEED has been getting plenty of Gunpla releases lately thanks to the HD remaster of the series. 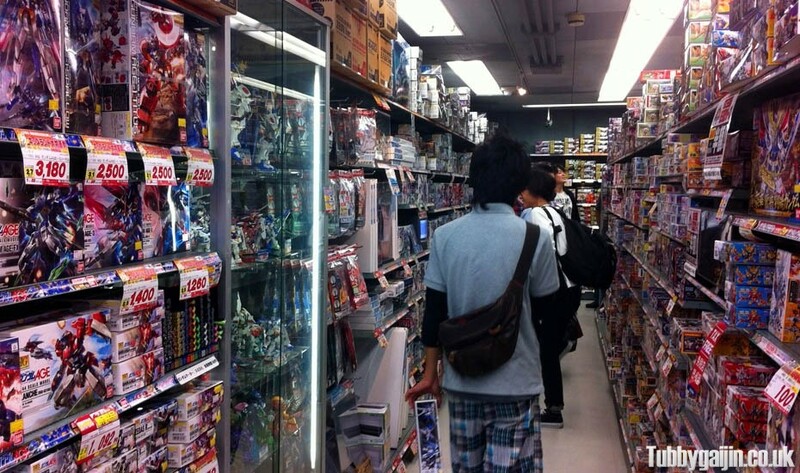 The Gundam AGE, 00 and SD aisle. Small screens are dotted around the store, playing various series from across the years. Perfect Grade section, also the 1/48 Mega Size kits live here! 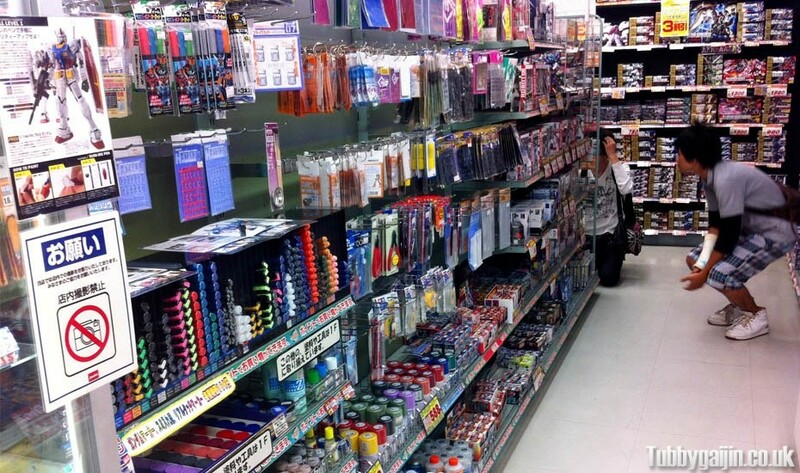 As well as model kits, the store if fully stocked with loads of magazines. 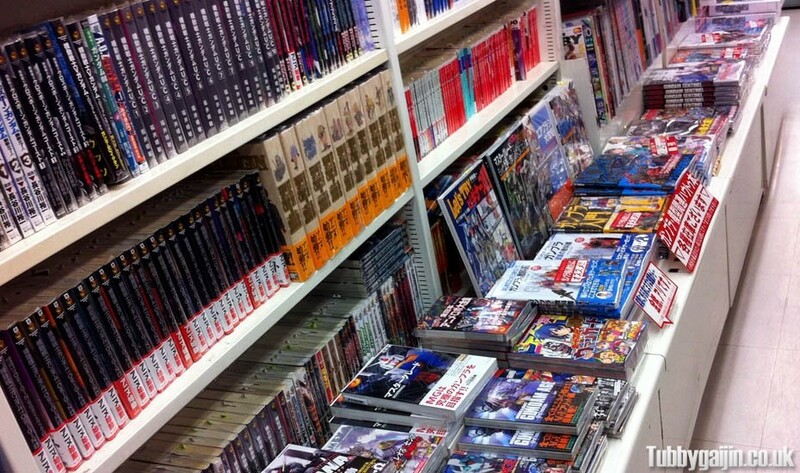 Books too, mostly manga adaptations but there are some nice artwork books too. 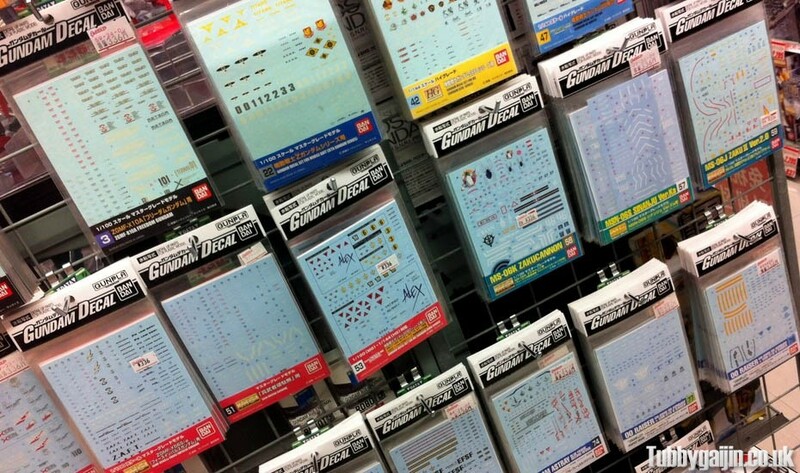 Lots of paints, markers and tools to help you unlock your Gunplas potential. The special items cabinet. This thing has a real mix of products, lighters, mugs, thermos cups, cutlery, and more! Finally, the clothing section, everything from normal t-shirts to a full Char outfit! 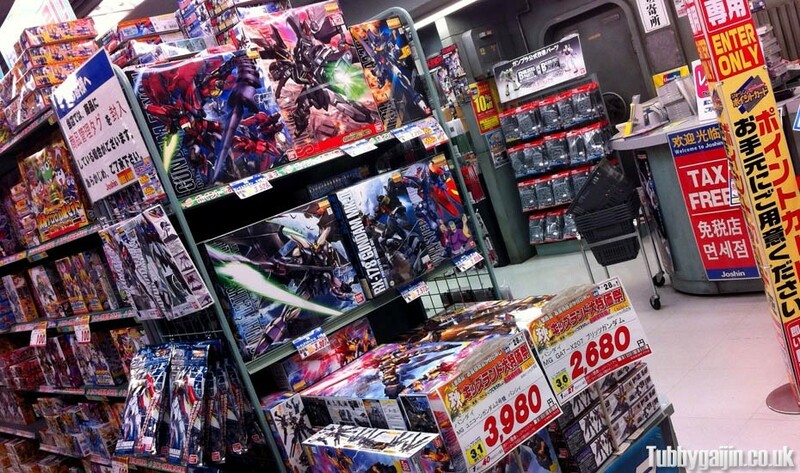 If you’re a Gunpla fan visiting Osaka, you mustn’t miss Osaka Gundams! Oh my god . I’d have been out of my gourd in there,not to mention out of pocket. Didn’t realise you’d resurrected the blog as well. Expect more random ramblings pal…. Oh me too, although I’m learning to resist, sometimes it’s nice to just go and have a look around. Wish I could communicate with the staff though! Resurrected? This blog never went anywhere, I didn’t post too much at the end of last year though 🙂 Are you still blogging, sir? Hey Johan, it depends on the kit really, HG’s are slightly cheaper, but sometimes there are some great deals on Perfect Grades! Akiba had some good deals too, not so much in Yodobashi, but LAOX hobby is a good place to check out. I just back from Japan. I was in this shop. I stayed maybe 1 hour in this paradise. The most difficult was first, to make a choice and two, to find a place in my baggage. 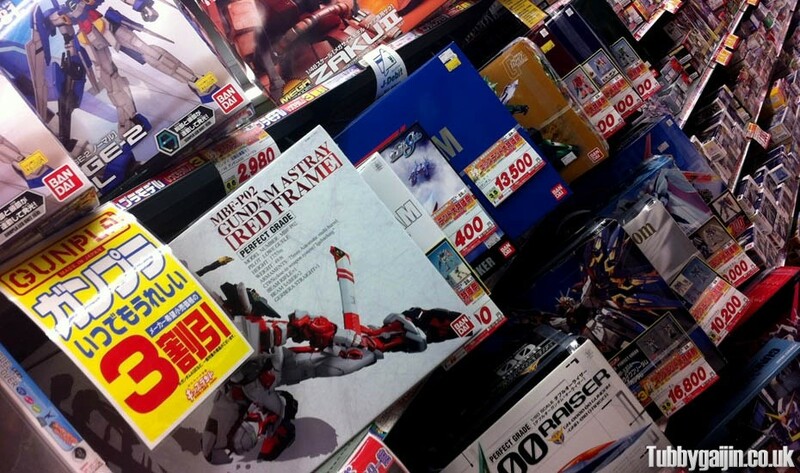 One of the best place to find the Gundam of your dreams. The second place is at Yodobashi at Osaka too. Hey Alec, glad you enjoyed it! Such a great store, I know what you mean about having trouble choosing things in there! I’ll actually be in Osaka for a couple of days later this month, and this store is definitely on my “must-swing-by-and-stay-a-while” list. If you don’t mind my asking, is there a train station you’d suggest getting off at to get to this place? Nipponbashi, perhaps? It doesn’t necessarily have to be the closest one, but rather, the most convenient (for someone not too familiar with the Japanese railway system). I’ll probably be coming from up north, Osaka station maybe. Hi, Isaac, sorry for the slow reply! If you’re coming from the north I’d head down to Namba on the Midosuji line, then change to the Sennichimae line for Nipponbashi. Exit number ten from Nipponbashi station is best then head south, it’s probably a 5-10 minute walk from there. If you have time, check out Bar #78 just around the corner! Awesome, thanks for the response! And thanks for the Bar #78 recommendation. Saw your post on its anniversary, and it looks like a great place! ?556-0005 Osaka-fu, Osaka-shi, Naniwa-ku, Nipponbashi, 4 Chome-10-1 ???????????????????? Can you get additional discounts in this store like with a point card similar to yodobashi? Yes! It’s a Joshin store so you can use their loyalty card, plus it’s tax free if you’re visiting Japan! Which one is cheaper,yodobashi akiba or this? Hi! This is awesome as I’m planning to visit Japan (well, for Gunpla purposes lol). Anyways, I’ll be coming from Tokyo.. and I’m actually not sure how to get to Osaka since it’s my first time visiting the country. Hey, Jham! Thanks for the comment! Ok, getting to Osaka from Tokyo is pretty easy, you’ll need to hop on the Shinkansen(bullet train) from Shinagawa – Takes a few hours. It arrives in Shin Osaka then Nipponbashi is a couple of subway trips away! Hi! Thanks for this 🙂 Me and the wife will be at osaka this april. Just wanted to know if kid’s land would accept credit cards. Hoping to complete my rg collection. How are the rg’s there. Thanks much!!! Hey Luke, yes they do! And don’t forget your passport so you get duty free prices 🙂 their RG selection is complete, around new year they were running out of things occasionally but April should be fine! Thanks for the tip to go there. Best prices I found! 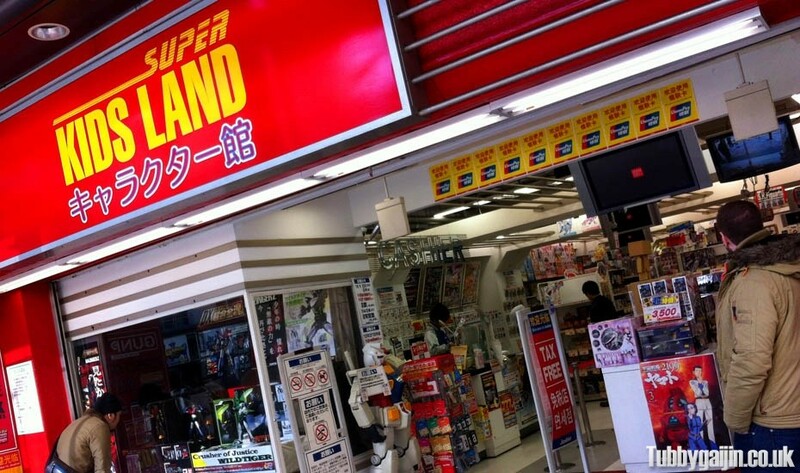 For others gou g here please be aware there are TWO super kids land stores and the other one has a small selection of Gundam kits too. So dont panic if your wondering why its such a small range. Just head down the road some more! Thanks, Matt, good tip there about the other Joshin! Now I need help, since i’ve never bought any perfect grade gundam, and i’m planning on buying the PG Strike Freedom. And i heard it has a huge box! Do you think i can bring it on board as handcarry? or do i need to prepare something so i can bring that box home? 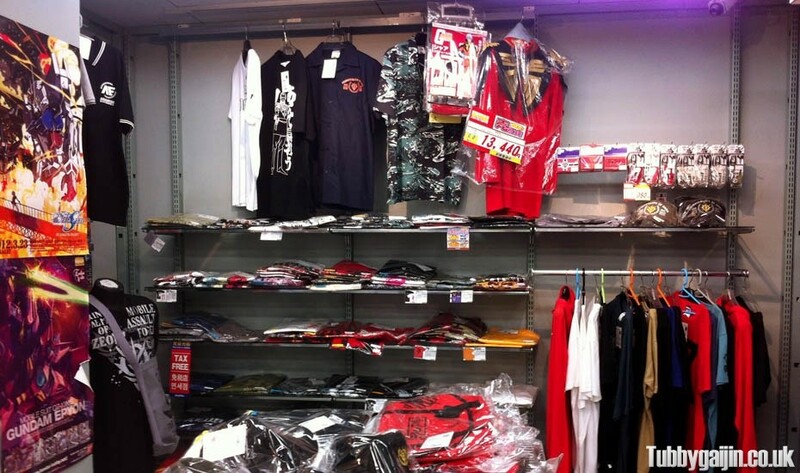 And do you think this store has the best price deal compare to others in akiba? Hehe, planning ahead is always good! October is a nice time of year to visit too, not to hot! To save space in the past I’d open Gunpla boxes, take out all the plastic packaging, making a bit of extra space, then pack other stuff in the box and jam it in my suitcase 🙂 one level further, my friend Rich spent an evening clipping off every piece, and bagging them up, extreme! I have one more question, what time is this store’s open hours? And is it open during weekend or any holiday? Hi James. Do you have contact number or email from the shop that you mention? Thanks for the writeup and extra info in the comments – it really helps planning. 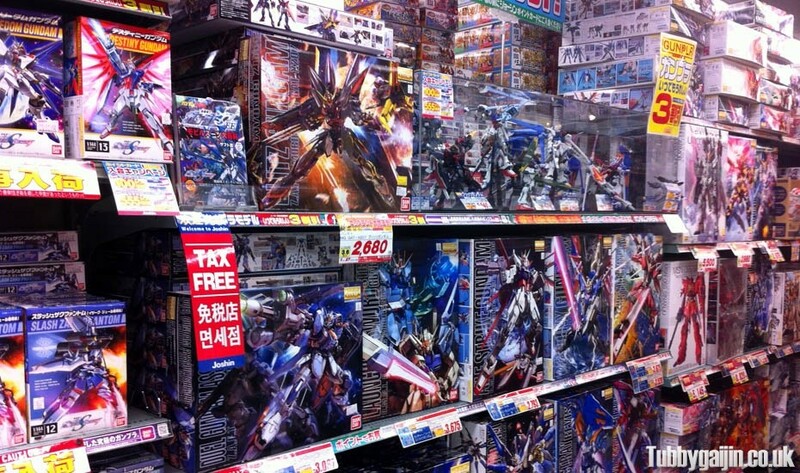 I was considering sending a box of Gunpla back home (South Africa) and was wondering what the best option would be? So far looks like using Japan Post and SAL method for a 2-3kg package is best – can you suggest anything else? Sorry, Nhut. They don’t have an online store. Tried HLJ.com or 1999.co.jp? HI!! Do they provide courier/shipping services or is there any of these services nearby? Sorry no, this is just a regular store. You could ship from the post office or many big hotels have a courier counter! Thanks for this review james. now i know where to go once we visit osaka this september. in september is that a okay month to stroll around that area.? September is great! The summer heat is subsiding but it’s still sunny! How are the prices for RG kits? Mine cost Y2000-Y2400 at Lalaport hobby store. Depending on complexity. I only do RG kits too, ahahaha. Hello James, Can you recommend a Gundam store in Tokyo? My name’s Dat. I’m a Vietnamese. After few years collect gunpla, I decide to open a shop in Vietnam. Doing some research I see your shop has a good rating. Could you please send to me some permission and special prize if I become your branch please. Sorry Dat, not my store. Just a blogger! Hello James … we’re sched to go to Osaka this April … is it ok to buy PG kits on that shop or rather i’ll go and buy at Yodobashi Osaka and Akiba? been dying to get my hands on a PG Zeta and Strike Freedom. Hi Fidel, I hope you have a big case – those kits are huge! You should be fine buying PG kits in this store, they had plenty recently. I was in Akiba last week and it felt a little cleared out, the selection definitely wasn’t as strong. So happy to know that, Yes i do have and prepared a big luggage bag for those PG boxes. Thanks for the info now i will just focus on buying at Osaka for Gundam Kits and i’ll just buy the Nintendo Switch at Tokyo. thanks a lot. One of my friends is in Osaka for a few months and she asked me If I would like for her to get something for me from Japan and my eyes “went” Gundam 🙂 where I live i can’t get this type of goodness and I been dreaming to get a PG for a long time (UC like RX-78-2 or maybe Mark II or RX-78 GP01/Fb one of these) . I was only asked to search for a place to find the the stuff I like and the solution to get it back to middle Europe (either by getting a large suit case and the extra fee for Lufthansa or she could send it back as a package) but my first problem is i don’t know how to get in contact with these shops like Osaka Gundams like email address facebook page website all I find is a phone number which is dead end cause I know some words but far from a conversation on specific subjects, is there an electronic way of reaching them? and if yes will they even communicate with me in like english? What I seen mostly on travel vlogs and documentary Japanese ppl seem very polite and friendly but as someone who is many km-s away will they even bother even if I can get in touch with them?